This just hit a little while ago I guess. This should makes things a little interesting I think. Will we see the more vendors join the 360 program, or maybe see the other vendors offer a comparable program themselves? I guess only time will tell. One thing you will want to make sure you go over in fine detail is the total cost and the requirements for the retake. The numbers I saw from Scott Morris in GS yesterday was it would cost roughly $5000 or so for all the material. Don’t forget you only get access to the 360 program material for twelve months. After that you lose access to it. I am not sure if youÂ can print everything out, but if you can then atleast you have hard copies of everything. If I don’t pass my lab in two weeks, might this be something to look at? 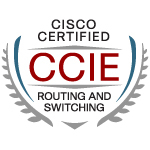 Together, the Cisco 360 Learning Program for CCIE Routing and Switching and the Cisco Lab Safe promotion allow qualifying learners who do not pass their first Cisco CCIEÂ® R&S lab exam attempt to retake the CCIE lab exam at no additional cost (a $1,400 US value). Only select Cisco Authorized Learning Partners offer the Cisco 360 Learning Program curriculum and Cisco Lab Safe promotion, which combined provide you with added assurance in the quality and value of your training investment. If you are following Group Study you will see an increasing trend in people reporting they’ve failed on account to the OEQ. Now usually one would think ok maybe they just weren’t prepared. Unfortunately the people now posting that they have failed all seem to have years of experience with a ton of time training as well.